The United States as a whole has had an interesting history with “speed limits” and here in Chapel Hill, NC it has been no different. Over the years, speeding fines for exceeding a maximum speed have evolved from a loosely enforced mechanism to the nation’s most ticketed moving violation. Let’s learn more about the history of the “speeding ticket” and what you should do if you are ticketed in Chapel Hill or Durham, NC. The first recorded law was founded in the colony of New Amsterdam (now New York) which issued a law in 1652 stating that “wagons, carts and sleighs cannot be run, rode or driven at a gallop.” Any cart or wagon who was found to exceed a gallop pace were required to pay two pounds Flemish, which is about $150 in current USD. The first actual state to pass a law which limited a motor vehicle speed was Connecticut in 1901. The law allowed motor vehicles to travel at 12 mph in cities and 15 mph outside city limits. As you can see the United States has had a long history with speed limits and “speeding violations” themselves. In those days it was hard to enforce and it took several more decades until police focused on enforcement of speed limit laws. Some people may remember the national gas shortages of the 1970s. In 1974 with rising gas prices and a looming national crisis President Richard Nixon instituted a national speed limit of 55mph. This was done in hopes of conservation of fuel across the United States but it also had an unintended effect of seeing traffic fatality rate decrease from 4.28 per million miles traveled in 1972 to 2.73 in 1983. 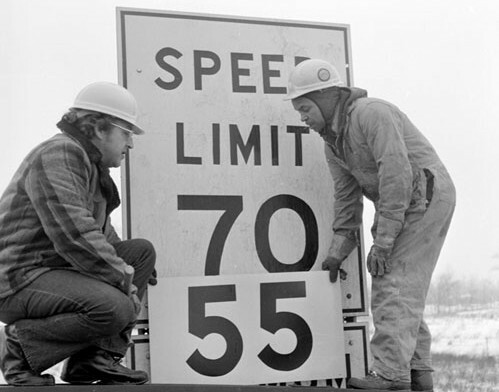 The law itself was met with massive resistance by the general public and these 55mph speed limit laws were widely ignored by motorist across the United States. This in-turn brought stringent enforcement of speed on the highways that has arguably lasted until today. Since 1974 thousands of Americans per year are written tickets and to this day they are a still hassle to deal with. Here at Matthew Charles Law, we pride ourselves in making this process easy and take a modern approach to helping our clients burdened by a local speeding ticket. Today speed limits and their fines are handled on a state by state basis. Here in NC, the average speeding violation will cost a driver around $200 in fines and court fees. This does not take into account increases in insurance premiums should your insurance provider choose to raise your rates because of a speeding violation. Here in North Carolina the average speed limit is actually 70mph which is tied for the highest average speed limit in all of the southeastern United States. Many of us obey the posted speed limit, however it is very common for a large portion of the driving population to exceed the maximum posted speed limit. It’s a common myth that a police officer will not pull you over if you’re going less than 5 mph over the speed limit but police agencies can issues a speeding violation to any vehicle going only 1mph over the legal limit. You are not protected from tickets going less than 5 mph! Take care when driving, if you do find yourself in the unfortunate situation of being issued a speeding violation, contact Matthew Charles Law today for immediate help. Here in Chapel Hill and all of North Carolina, the standard time that a speeding violation will cause increased premiums is 3 years. Other then switching to a vehicle with a lower insurance liability there is no way to retroactively lower insurance rates after a ticket is on your record. The best way to prevent your insurance from rising is to fight the ticket with an experienced attorney by your side in the first place. Traffic tickets are proactive situations and Matthew Charles law has valuable experience fighting speeding violations for our clients. Over the years Matthew has defended hundreds of Speeding violation cases both in District and Superior Courts throughout the state. As such, Matthew has the skill set and experience necessary to handle your Speeding Ticket case. Give the Law Office of Matthew Charles Suczynski, PLLC a call today to discuss your case at (919) 619-3242 or visit our Traffic Law page for more information.